To go along with my British inspired Valentine’s Day menu of Beef Wellington sandwiches, I thought, what would be better than Sticky Toffee Pudding? I don’t know if it gets much more British than this dessert. The classic version has dates as a main ingredient. When I came up with my take, I realized that my dates had gone bad so I scrambled to find what would be a good replacement. I always have a big bag of large raisins on hand because I have them in my oatmeal and yogurt every day. This toffee soaked cake is always a hit, even with my friends who aren’t fond of raisins. The flavors just all go together so well! 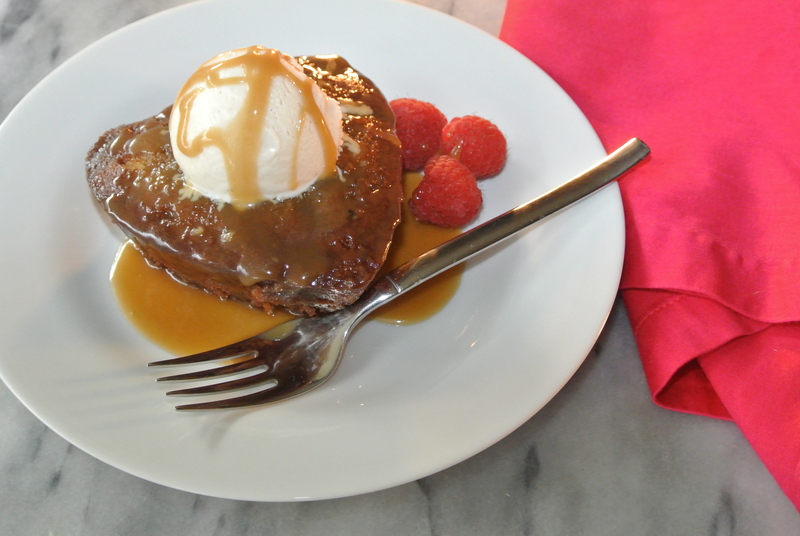 Make my Bourbon Soaked Sticky Toffee Pudding for your sweetheart this Valentine’s Day (or any day) — it’s a real winner. Start by putting raisins, orange juice, bourbon and water in a saucepan; bring to a simmer. Simmer for 5 -10 minutes until the raisins are plumped and the liquid is syrupy. Add in the baking soda and stir (it will foam). Set aside to cool. In the bowl of a mixer, cream the butter and sugars together. Add in the eggs one at a time and mix until incorporated. Add in vanilla and orange zest. Slowly add in the dry ingredients and mix until incorporated, scraping down the bowl as needed. Add the raisins and syrup to the batter and mix until just combined. Divide mixture between four greased and floured 8-ounce ramekins. Bake for 30 minutes until a toothpick comes out clean. While the cakes are baking, combine the butter, sugar, half and half and salt in a saucepan. Whisk and bring to a boil while continuing to whisk. Boil mixture for up to 5 minutes over medium heat until a sauce is formed. Add in bourbon at the end. Once the cakes are done, remove from the oven and poke them all over with a toothpick. Drizzle a tablespoon or two of the toffee sauce over each to be absorbed. Set aside. After 5 minutes you can either leave the cakes in the ramekins or invert and pop them out onto a plate for a fancier presentation. Serve warm right away. The cakes can also be reheated in the oven on low heat. Serve with more toffee sauce and vanilla ice cream!